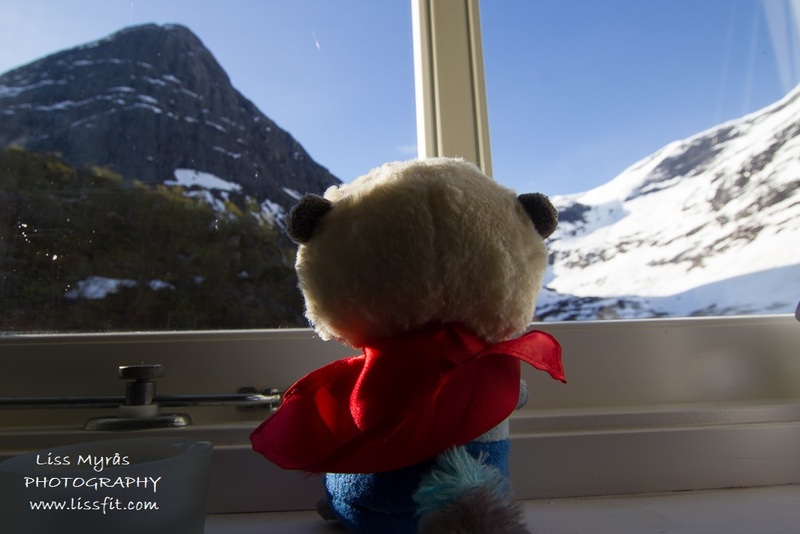 Oppstryn. This pearl of a hike through glacial valleys and precipitous mountain sides is as long or as short as you want it to be, do a morning speed hike, a day trip with your family or stay overnight. I did one of the “longer” versions since I had to bicycle upwards the part most people drive up, and as my “roommate” had her boyfriend coming for visit – it was a win/win opportunity to spend a night in one of DNT’s* mountain cabins. (you can too! – se more information at the end of this post). Along this trail you will here and there have a glimpse of Jostedalsbreen parts among the mountain peaks, wich is the largest glacier on the European mainland. It was a wonderful morning with the very best weather to wish for.. after biking a while on the main road 15 to the end of the lake, I took off upwards and into Erdalen.. it was an absolute thrill bicycling along this mountain road while the mist was still covering the mountain peaks..
Now and then I could hear or see the rumble and roar when spring avalanches came sliding downwards along the mountain side.. Finally I reached the parking area Loppeset where also the trail starts, and left my bicycle lashed to a tree. The first part of the trail into Erdalsetra/Storesætra is nice and easy. still slightly covered with a little bit soft snow here and there in the spring. Arriving at Erdalsetra a cute dog came running to welcome me. 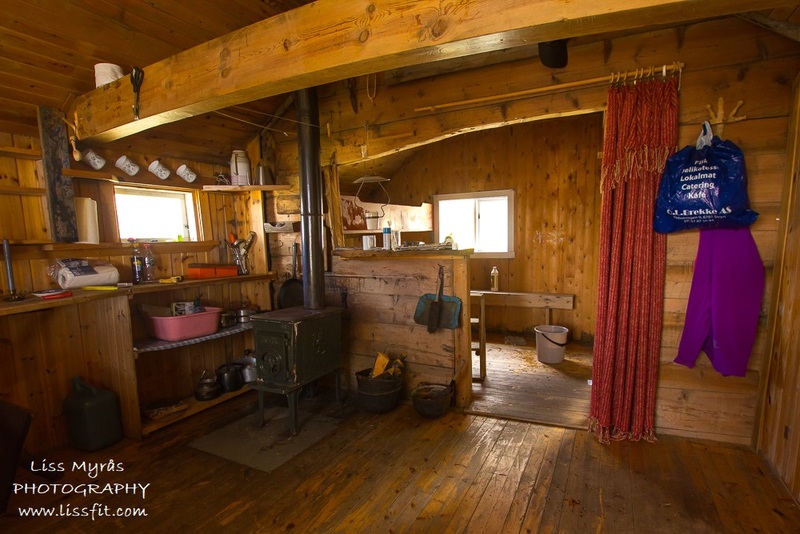 I started to talk to a woman who was cleaning and preparing her old mountain hut for the summer, and she invited me in to see the old hut inside. Oh so very cosy and charming. 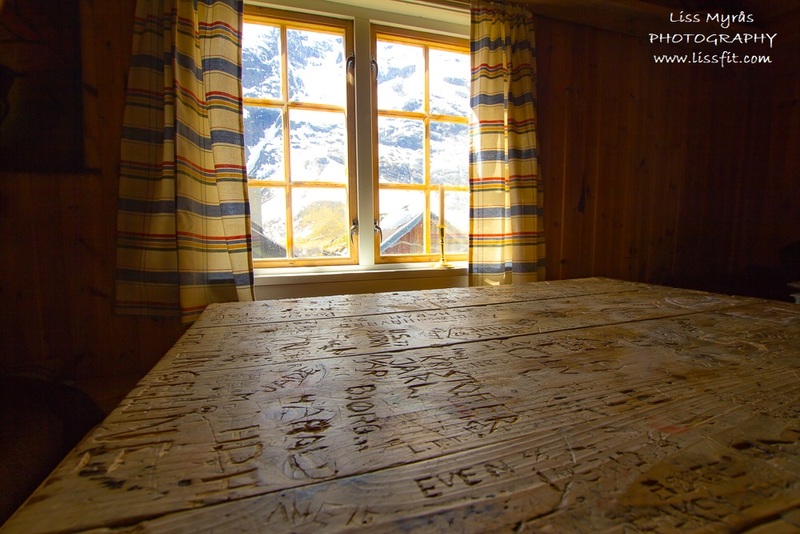 Nnd now and then mountain teams sleep over in the cabins before they start crossing the Jostedalsbreen glacier. 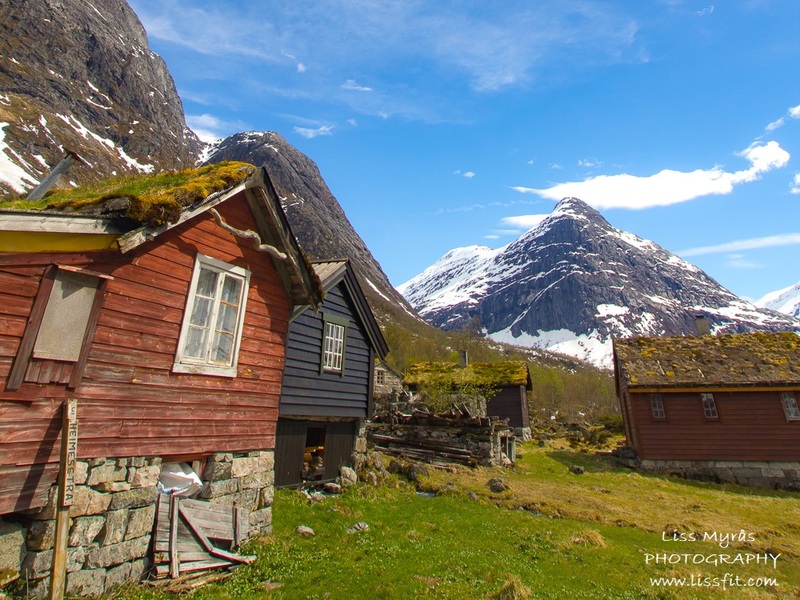 Erdalsetra with it’s many huts, and they are still in use! After saying goodbye I continued on the last part to Vetledalssetra, with a bit more snow along the trail, but fully possible to handle. I had the DNT-key* to access the cabin (in case it was locket), and packet up my stuff indoor and took an extra afternoon hike uphill and could not resist a quick wash in the crystal clear glacial river. 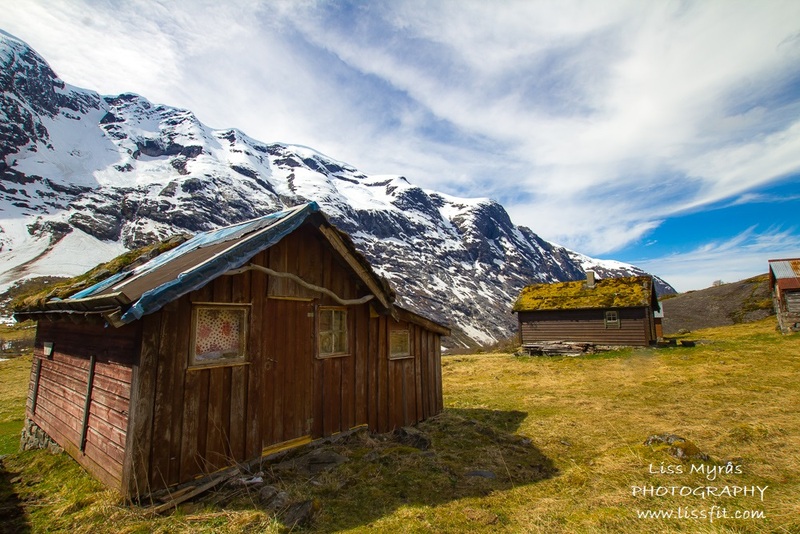 You can also continue to the right of Strynekåpa for a shorter hike up to the emergency hut Infimus to get a closer view of the glacier. Strynekåpa is for sure a guiding monument through this hike, and the peak are looming about 1530 m.a.s.l. over the valleys.. trails both to the right and left side of it leads up to enter the glacier itself.. where you will need a guide if you are not experienced! I can tell you right away that nothing extraordinary or too exiting stuff happened on this hike, I was just enjoying the peaceful solitude with no internet connections..(yeas I tried alright), and taking care of the need to reload after being super-social… give my head a rest and fill up with energy. Surroundings like this is of a very healing nature, and it is absolutely wonderful that doctors finally have started to prescribe it as medicine for mental health! 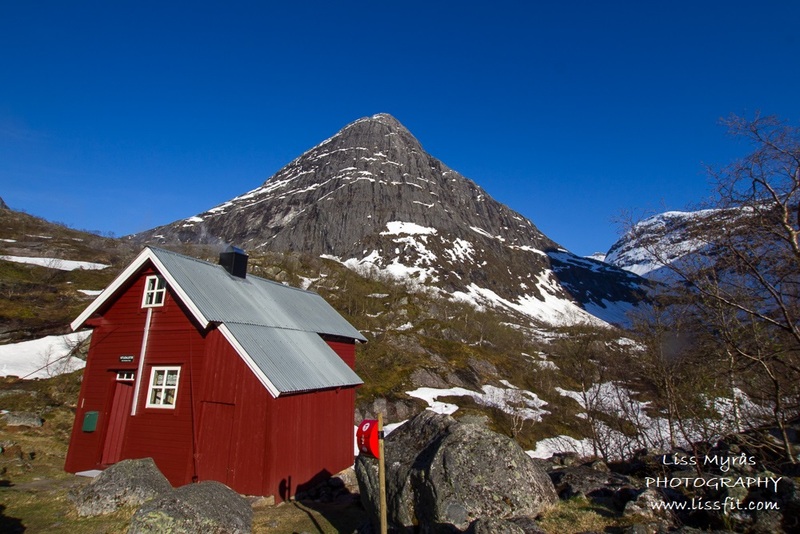 At Vetledalssetra there are a few but very beautiful and well maintained huts still in use… this one is my favourite! 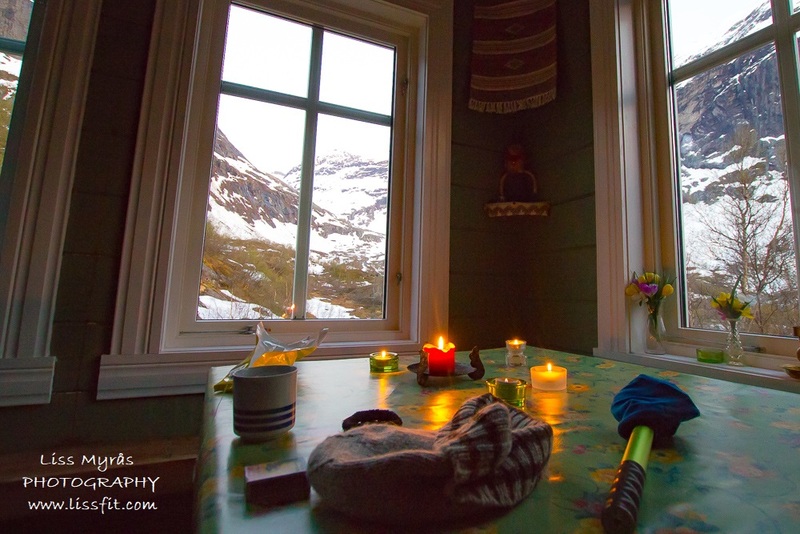 The only “happenings” here was me getting the wood-burning stove going (the gas stove was empty) to cook a simple supper and a gigantic cup of coffee on it, enjoying the beautiful sunset outdoor, accompanied by rumbling glacier avalanches now and then …and a glass of white wine on top of it all (someone left it in the cabin for someone like me..ha..ha). A lovely day and just what I needed to reset and reload. Evening supper of warm soup with bread, mashed potatoes and a giang cup of coffee. Who needs TV or Internet here? Nobody!! 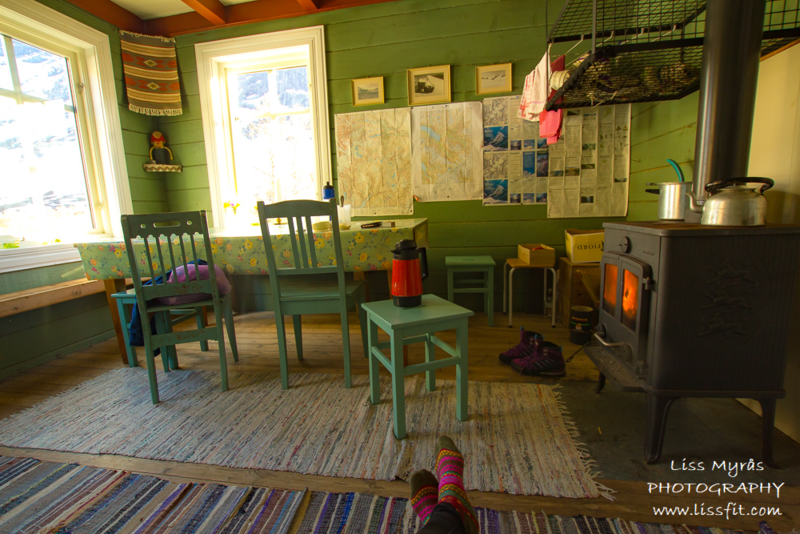 Since no other hikers came along that evening, I decided to stay in the living room near the wooden stove and sleep on a old wooden sofa – oh it was so nice to just lie there looking out on the snow-covered mountain peaks and listen to the crackling fire-place…. guess who slept like a stone! A wonderful day is turning into night, and even if I am alone I feel so safe up here and wish everyone in this world could feel the same… the old gneiss hut to the right is almost as beautiful and steady as the mountain itself, built to last… more of that please.. 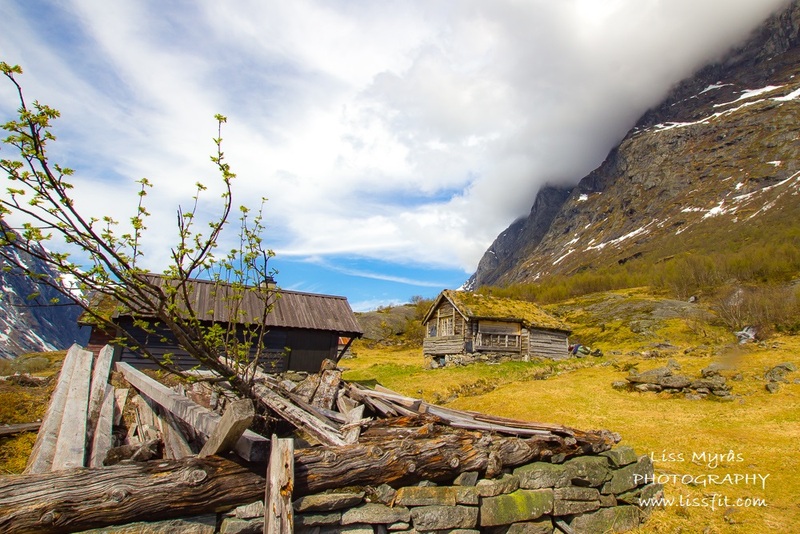 This route is an old road/cattle track used to get up on and crossing the glacier (the glacier reached further into the valley those days) to the other side, bringing their livestock all the way over the glacier to provide people on the eastern side of Norway with fresh meat. Just imagine the sight of this procession – wow! 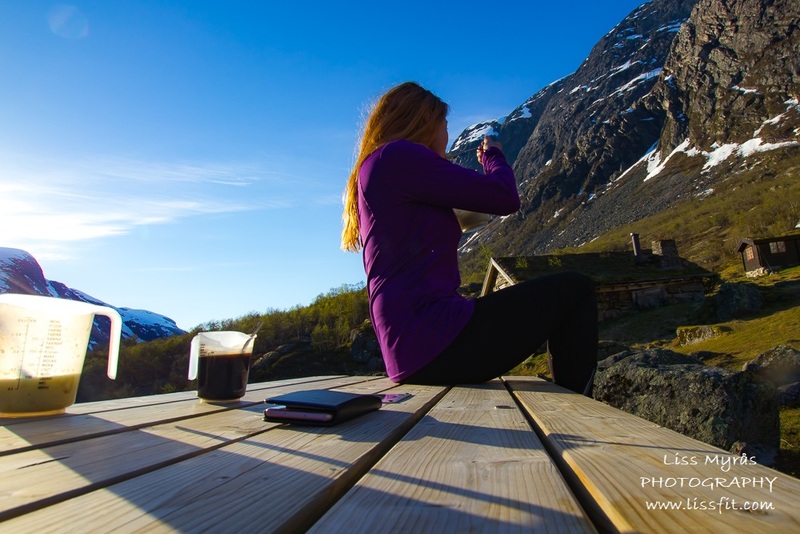 DNT: As a member of DNT (The Norwegian Trekking Association) you will also get a discount on lodging and food/supplies at most of DNT’s huts and cabins all over Norway, and also access to a key that will work on most cabin locks. It sure is lovely when you don’t need to carry a too heavy backpack when hiking in the Norwegian mountains. Read more at DNT’s homepage.